The Service Desk Institute (SDI) has been connecting IT service professionals across the world since 1988 and is the leading global community for everyone working in the IT service and support industry. Our mission is to inspire service desks and service desk professionals to be brilliant. With a passion for providing industry best practice and sharing knowledge, SDI has dedicated the last 30 years to guiding, inspiring and connecting ITSM and service desk communities. A respected, trusted and independent advisor to the service desk industry, SDI has inspired thousands of organisations and professionals around the world to embark on their own journeys of service improvement and to be the best they can possibly be. Service Desk Institute is in a unique position as the creators of the professional standards that all of SDI’s qualification training courses and workshops are built on. SDI is passionate about inspiring service desks to be brilliant and believe that continual training is fundamental in achieving this. SDI’s unique set of courses will make a real difference to your career and your CV whether you’re an analyst, a team leader, manager or responsible for an entire IT service department. There’s only one way to guarantee to an IT service employer that you’re more capable and brilliant than the next candidate and that’s to hold a recognised, professional SDI Service Desk Manager or Service Desk Analyst qualification. Qualifications designed specifically for their roles. Three levels provide a structured career path and progression route. Ability to demonstrate understanding of service desk requirements, skills and best practices to an employer. Industry generic allowing skills to be applied outside of current organisation. Source of continued professional development for IT support profession. Staff equipped with skills and knowledge of best practices specific to roles. Positive impact on the efficient running of service desk & IT support functions. Increased productivity and customer satisfaction. Excellent for training new starters. Aids preparation for service desk audit if required/appropriate. This course equips analysts with the essential skills for delivering an excellent level of customer service and support. A thorough grounding in the skills, competencies and knowledge required of a professional and effective service desk and support analyst. The essential skills and competences to deliver efficient and effective support in line with SDI’s best practice industry standards. A clear understanding of how to identify customer needs and motivations, how to deal effectively with a variety of situations. The ability to recognise the importance of teamwork in the support environment. An understanding of service desk metrics, service level agreements, customer satisfaction surveys and the latest service desk tools and technologies. An awareness of the need for developing professional relationships and for displaying respect and cultural sensitivity. Practical preparation for passing the SDA examination with APMG International. The training lasts three days. For this training workload is not applicable. Our expert instructors and study materials provide results-oriented, classroom training. 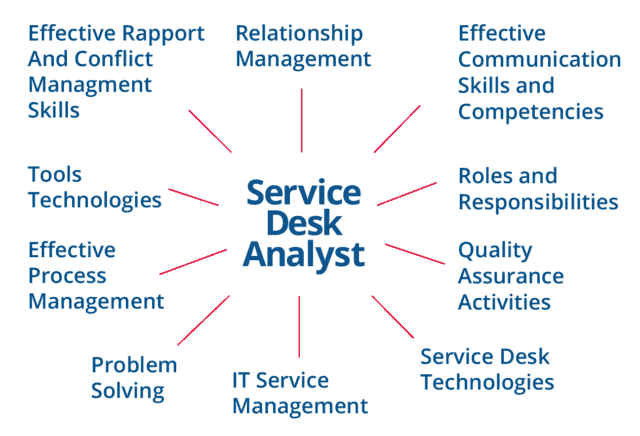 The course includes a mix of instructor-led training and hands-on exercises to help participants understand and apply the principles of Service Desk Analyst Skills. At the end of the training, a certificate of participation will be sent to you via email and you can sit for an official APMG exam. This course is designed to provide service desk and support analysts with the skills to work consistently within industry recognised standards and in-line with the best practices guidelines. It reviews the four key concepts covered in the standards: professionalism and roles, analyst skills, process and supported technologies and enabling tolls, on which the skills, competencies and knowledge required to deliver professional and effective support are based. The study materials include handouts of the presentations and exercises. At the end of the training, these materials will be sent to you via email. Our online support system offer the opportunity to exchange ideas with our practice-experienced professionals about the possibilities and problems that are experienced in applying the learned knowledge and skills and in the successful execution of the planned improvement actions. During and up to 3 months after the end of the course, students have access to this system. During and up to 3 months after the end of the course, we offer support to the students in the study of the theory. This takes place on an individual basis or in a group. Per student the price of this public training is €1.185 excluding VAT or €1.303,50 free of VAT. This includes a digital version of the study materials, location and arrangement costs and a digital certificate of participation. A Support Voucher is provided to each participant of a public training. With this voucher, access to our online system can be obtained. This course can also be run as an in-house course, see our webpage on in-house training for more information. Please contact us for more information. This training is provided in Dutch and in English. The materials and the exams are only available in English.